The time to take action is now, and prayer is the first step. Here are five ways you can immediately start praying for persecuted Christians worldwide. 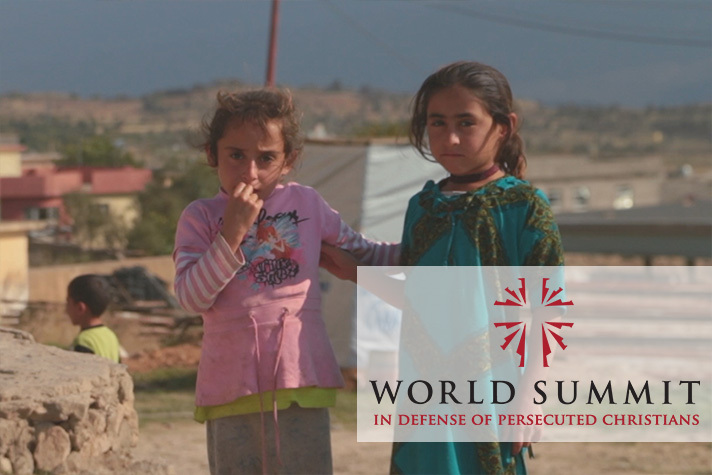 Please continue to pray as the World Summit in Defense of Persecuted Christians gets underway on May 10. The event will raise awareness and advocate change as hundreds of church leaders, victims of persecution and others gather to talk about the recent, unprecedented persecution of Christians throughout the world, from Mexico to Syria. “Prayer is the Christian’s greatest weapon,” Billy Graham once said. Consider the following five points as you battle for your fellow Christian brothers and sisters worldwide. Global watchdog Open Doors reports that 322 Christians are killed every month for their faith while millions more suffer persecution on a routine basis. Please pray that these believers will not only stay committed to the call of Christ but also will respond in love to the evil shown by their aggressors. God’s love will open doors for these believers to share the Gospel even more. Pray that God would open the eyes and soften the hearts of these individuals who bring unfathomable abuse upon Christians. Remember as you pray that God sent His Son for the whole world (John 3:16, ESV); He does not want anybody—even these individuals—to perish (Ezekiel 18:23, ESV). Ask God to comfort families who many times do not receive updates about their loved one and are not allowed to visit, or it’s simply not safe enough to do so. Pray they, too, will remain faithful to the calling God has placed on their lives. Support from the body of Christ is so critical. Whether we are giving up our time in prayer or our resources in physical support, the church must rally around those suffering for Christ. American Christians also should rattle the door of Washington by writing their elected officials. Remind them the persecution of Christians is a real issue that must be addressed. God makes it clear in His Word that leaders have a responsibility. Pray God would stir their hearts, and they would not only draft but enact the necessary policies and procedures to make a lasting, global difference. Thank you for taking an active role in the fight against persecution. Please consider sharing this prayer list with others by using the Facebook and Twitter buttons at the top of the article.